Saturday January 21 1911 Did forenoon work. Will went to town at 12.15. I an hour later. Met Mrs Smith & Gertrude Hattie & Cora at The Rest Room to go to the Matinee. There was more so we went to all three of the [illegible]. [illegible] I saw the Dr and got home at 5.30. A fine time. Sunday January 22 1911 I went to church and read and wrote what spare time I had. A cold raw day. Monday January 25 1911 Will helped me to the working. I got the dinner did a lot of cleaning up and after supper did the ironing. It was a fine bright day. 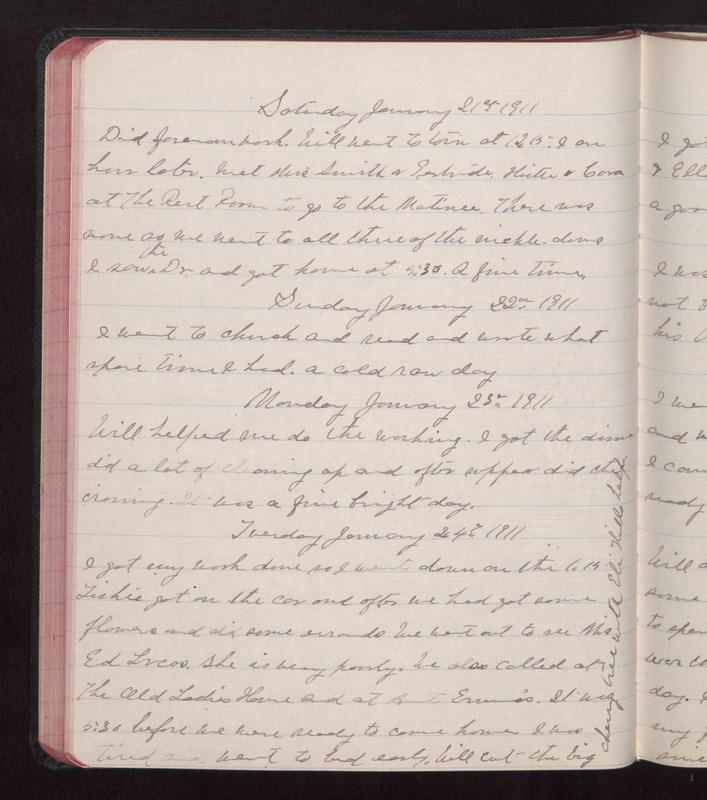 Tuesday January 24 1911 I got my work done so I went down on the 1.15 Tishie got on the car and after we had got some flowers and did some errands we went to see Mrs Ed Lucas. She is very poorly. We also called at The Old Ladies Home and at Aunt Emma's. It was 5.30 before we were ready to come home. I was tired and went to bed early. Will cut the big cherry tree with Eli Hills help.